Posted on Wednesday, August 31st, 2016 at 11:56 am. SpectaCare Prevention Services offers Prescription Drug Take Back events on a regular basis in the Wiregrass area. As a matter of fact, you can track the next Take Back event by subscribing to our Facebook Events calendar. But you might be wondering what a Prescription Drug Take Back event is and what it’s purpose is. In this post will discuss what is it, its purpose, where the events take place, and how you can be involved. 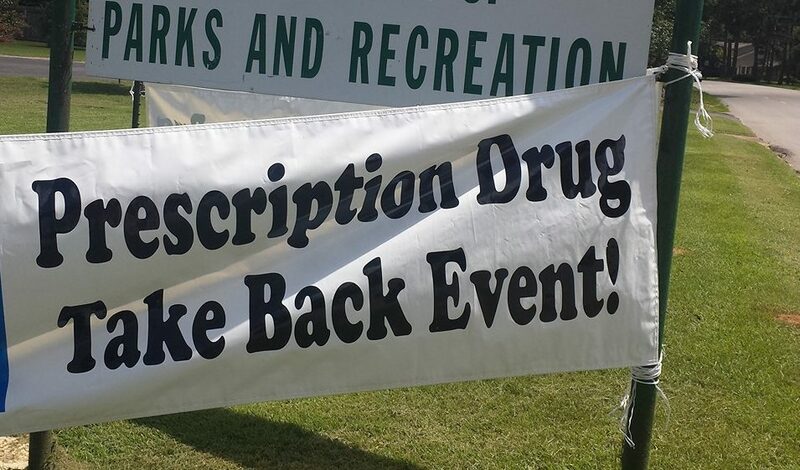 What’s a Prescription Drug Take Back event? A Prescription Drug Take Back event is a method to properly dispose of prescription drugs to prevent misuse. 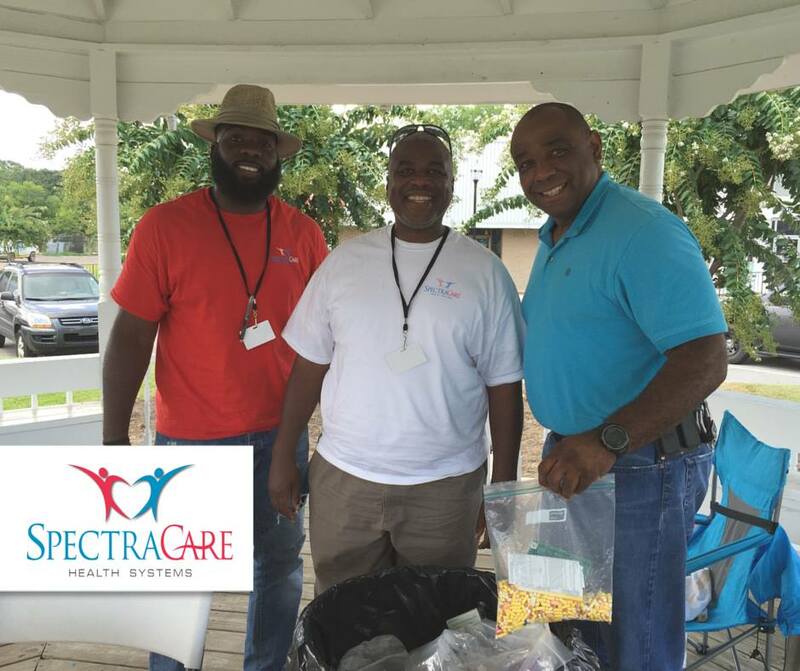 Take Back events are organized by the SpectraCare’s prevention team in collaboration with local law enforcement. Periodically, an event is hosted in one of the many counties we serve. Local businesses and organizations get in on the action as well by allowing us to use their location as the drop off site. During the event, area residents can anonymously drop off their unwanted and unused prescription drugs. Simply drop off and be on your way. There’s little effort on the consumer’s end other than meeting us at the location. Prevention Specialists assist the law enforcement present at the event with accounting for the drugs turned in. Upon the completion of the event, law enforcement will properly dispose of the drugs. There’s many reasons why Prescription Drug Take Back events are needed. By properly disposing of the drugs it helps prevent misuse, break-ins, and improper disposal in water systems. Misuse can be defined as overdosing, taking someone else’s drugs, leaving them within reach of children, or use with the intentions of takings one’s own life. Simply, misuse is taking the prescription drugs in a way in which it was not prescribed. By turning in prescription drugs, you help to greatly reduce the misuse of those drugs. Believe it or not, break-ins are less likely to happen when prescription drugs are turned in. Local law enforcement officers have explained that when people know there are drugs in a home, it increases the chances of a break-in. Prescription Drug Take Back events helps to keep our neighborhoods safe and decreases criminal activity. Prescription Drug Take Back events also keeps your water system clean and drug free. Did you know that if water systems become polluted with drugs, the city must use more chemicals to counter the unsafe water? For years people have not thought twice about the harm that is done when dumping prescription drugs down the drain. However, Prescription Drug Take Back events are the perfect solution to safely dispose of drugs. Where are the event locations? Each Prescription Drug Take Back event is located in various places, based upon community response. In the past we’ve set up in town squares, senior centers, and police stations. 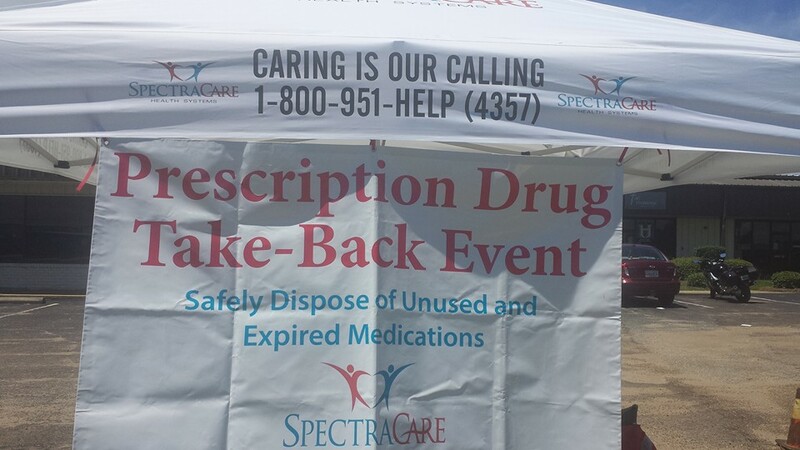 SpectraCare, in collaboration with local law enforcement has held Prescription Drug Take Back events in the following counties – Dale, Geneva, Henry, Butler, Crenshaw, and Coffee. The best way to track event location is by subscribing to our Facebook Events calendar. There are various ways to help this cause. Bring your unwanted and unused prescription drugs to the events. Tell your family and friends about the events. Let us set up at your business or organization. Share the Facebook Event posts with your Facebook friends. Hang a flyer at your business or organization.